This resource was created to provide a wealth of knowledge related to an exciting theme. Feel free to add/take out any activities you feel do not fit your needs or interests. Before starting your Thematic Activity, you want to make sure that you have gathered all necessary resources so that you are well prepared in advance. You will need a way to display videos and photos to your group (Smart Board, projector, etc.). Books and media can be obtained from your local library. Feel free to add intergenerational resources to your event to offer the chance for generations to share in the fun. There are many videos available on YouTube for your Super Bowl/Football theme. You have the option of sending out invitations, to further engage/remind participants. A hand-written invitation could make the difference in whether someone will decide to attend your activities. Decorate your bulletin board to follow the Super Bowl/Football theme – Be creative and use real items to add a 3D effect to your board, such as: a football, turf, jersey, a whistle, team colors/photos, etc. 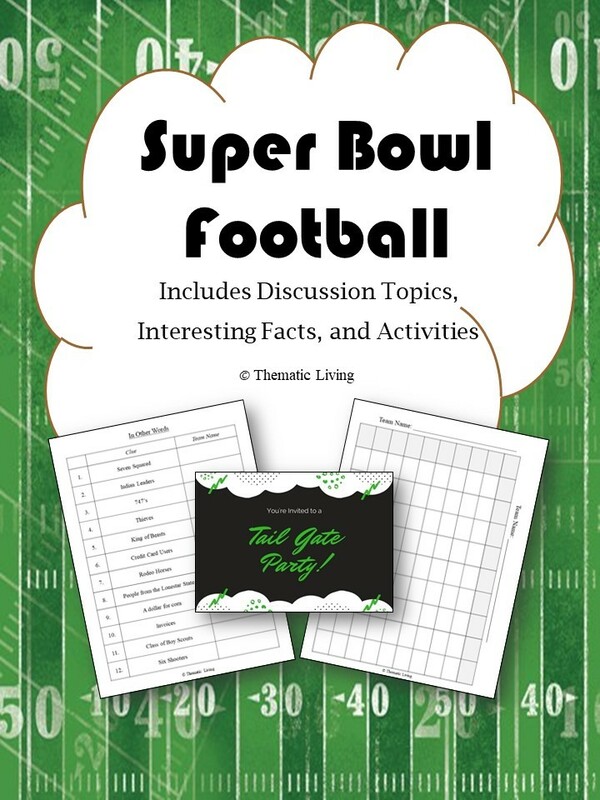 In addition to decorating your bulletin boards, you can post a poll: For example, the title/heading of the board could be “Which Super Bowl/Football food is your favorite?”; the options could be pizza or chicken wings. Throughout the day participants can cast their votes either on paper or by adding a tally. Using an oversized map or globe to pinpoint where the game is taking place can serve as a visual aid.